An international team led by Dr. Rajiv Chowdhury of the University of Cambridge, showed that saturated fat does not increase the risk of heart disease and that the evidence of harm does not appear to be statistically significant. This directly challenges everything we have previously been told. There was no evidence to support that we should restrict saturated fat consumption to lower our risk of developing heart disease. There was not enough evidence to support that eating more food containing polyunsaturated fats (such as omega 3 and omega 6) would reduce heart disease. The influence on developing heart disease varied even within the same family of fatty acids such as the different types of omega 3. The saturated fat was measured in two different ways: as part of an individual’s diet and measuring the levels in the blood stream. The study found that total saturated fatty acid was not linked to coronary disease risk with either of these measures. When the research team compared the top third of people to those individual’s in the bottom third of their dietary fatty acid intake , only trans fatty acid intake was associated with an increasing risk of coronary disease like heart attack, angina and coronary death. Why Does Saturated Fat Have Such a Bad Reputation? It is known that saturated fat increases low-density lipoprotein cholesterol, (LDL), the kind that raises the risk for heart attacks. But the relationship between saturated fat and LDL is complex, said Dr Chowdhury. In addition to raising LDL cholesterol, saturated fat also increases high-density lipoprotein, or HDL, the “good” cholesterol. What we should be concerned with is the smallest and densest form of LDL. These form of LDL’s are more easily oxidised and therefore more likely to set off inflammation and contribute to the buildup of artery-narrowing plaque. This clinical picture usually partners with high triglycerides and low levels of HDL’s – risk factors for both heart attack and strokes. These artery clogging particles appear not to be caused by saturated fat but by sugary foods and an excess of poor quality carbohydrates. Interestingly individual subtypes of polyunsaturated fatty acids such as long-chain omega-3 and omega-6 fatty acids influence heart risk differently. Bloodstream levels of eicosapentaenoic and docosahexaenoic acids (two main types of long-chain omega-3 polyunsaturated fatty acids), and arachidonic acid (an omega-6 fatty acid) are linked to lower heart risk. It is possible that the role of omega 3 fatty acids lies not in reversing heart disease but more that it can prevent it. Future research regarding this is currently underway and will hopefully answer some puzzling questions. Cardiovascular disease, or more specifically coronary heart disease is the single leading cause of both death and disability globally. In 2008 alone 17 million people died from cardiovascular disease. As healthcare providers it is vital that we offer prevention guidelines which are backed by the best scientific evidence. So how does this impact on the way we should view saturated fat? Well no longer should the focus be solely on saturated versus unsaturated fats. Rather we should concentrate on the food sources of the types of fatty acid as well as other foods. By still looking at individual fats and other single nutrients we can only get a small part of the picture as people tend to replace fats with more bread, cold cereals and other refined carbohydrates that can also be bad for cardiovascular health. Therefore we should be concentrating on real food rather then giving a cutoff for certain macronutrients such as fatty acids. A Mediterranean diet for example complete with nuts, fish, avocado, high fibre grains and extra virgin olive oil reduces heart attacks and strokes when compared with a lower fat diet with more starches. The message is clear – eat more healthy food and cut back on the processed junk foods. We should remind ourselves though that even if saturated fats doesn’t directly harm your heart , eating too much can contribute to obesity which itself is a risk factor for damaging your heart. So eat a healthy, balanced diet, be physically active and don’t smoke are all manageable ways to keep your heart healthy. If you would like to know more about your current cardiovascular health, consider an Emed Cardiovascular Profile. This extensive profile will test for cardiovascular disease markers and receive a comprehensive report outlining your results and specialised treatment plan. If you would like to know more, speak to your Emed Practitioner today! 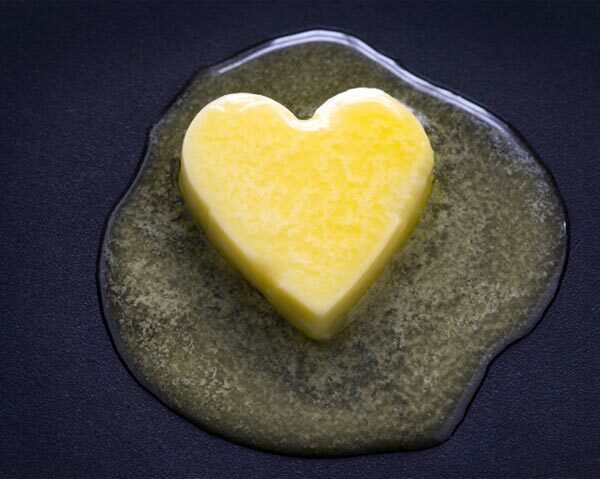 So you do know that saturated fat does not cause heart disease. Why do you state in other articles to avoid saturated fat? Hi Heather, thank you for your question. The other articles were sourced from older research while this article was based on research from March 2014. However it is important to note that including any saturated fat in the diet should be done in moderation as it can contribute to obesity if eaten to excess which is a risk factor for heart disease.